Police Declare Militia Leader, Terwase Akwaza Wanted – Royal Times of Nigeria. The Police also announced that the Benue State Government is offering 10 million Naira to anyone who provides information leading to his arrest. 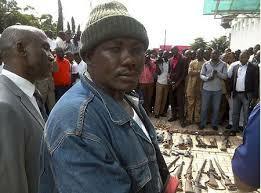 Terwase is accused of killing 17 people and destroying property running into millions of Naira in Zaki Biam, Benue State. So far, 50 people have been killed in several attacks allegedly masterminded by the militia leader.